There is nothing wrong with rote memorization in order to learn Kanji. In fact, for me, it helps me to lay the strong foundation upon which I’ll build more advanced skills. In the case of learning Japanese kanji, this is no exception. Flashcards are great, flash quizzes (if you’re in a class) keep you sharp, and drills are helpful. By practicing writing down each kanji, no matter how much of a pain it can be, does wonders for your progress. However, at some point, you’ll need to move on to the practical, everyday use of kanji (reading and writing), and rote memorization will only get you so far. You’ll need to understand how the meaning and pronunciation of certain kanji can change, depending on the context surrounding it. So! What to do? Well, a great way to start learning kanji is to dive into some Japanese content and start reading! Reading can help see how kanji is used in different context. The possibilities are almost endless when it comes to kanji (there are thousands to learn, after all). And while some people choose to learn as much as the kanji as they possibly can, you don’t have to. By reading Japanese, you’ll start to get an idea of which kanji appears frequently and which ones don’t. The ones that do are ones you should be more concerned about. Anyways, let’s address the basic level, for now. After all, big things have small beginnings. Below is a kanji chart, as well as some contexts you may find some of those kanji pop up in. Specifically, this is 1st grade jouyou kanji (everyday kanji that students are required to learn), which are officially announced by the Japanese Ministry of Education. This is a great example of a level 1 kanji that has many different meanings, depending on the context. Below are a few different ways it can be used. Another kanji for beginners to learn, 先 has several meanings and pronunciations. Thank you for what you did (back there, a previous time). Koko kara saki ni wa ikemasen. You can’t go any farther from here. Last month, I went home to Michigan. See what I’m saying about context? It can be a little overwhelming when you start to realize how many different ways kanji can be pronounced and the different meanings can be inferred with each one. That’s why it’s always best to study material YOU are interested in. If you really want to stay motivated, get a hold of content that you enjoy. Whether it’s sports movies, or anime, as long as it’s interesting, you’ll keep reading. The more you keep reading, the more kanji you’ll see and start recognizing. Speaking of interesting content, LingQ has thousands of hours of content for you to dive into. Even if you aren’t able to find content you enjoy, you have the option of importing other content on the web into LingQ. 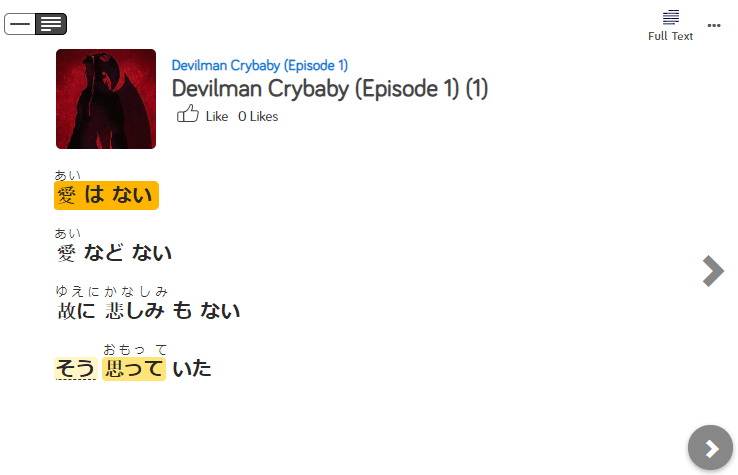 In fact, check out our other post about how to import anime subtitles into LingQ for studying purposes.. As you can see in the picture below, LingQ also includes furigana which is helpful for beginners who want to learn kanji. Learning kanji in context is not only more enjoyable, but also speeds up your learning process. Even 30 minutes of reading a day will dramatically improve your kanji vocabulary and Japanese. So stop wasting time and start opening those books (and importing lessons too). Kristen Barrett is based in New York City and previously lived in Japan teaching English for a year. Try These 15 Japanese Tongue Twisters!